As usual, the game is available in three variants – Pro, Premium and LE – with suggested prices of $5,999 for the Pro, $7,599 for the Premium and $8,999 for the Limited Edition. 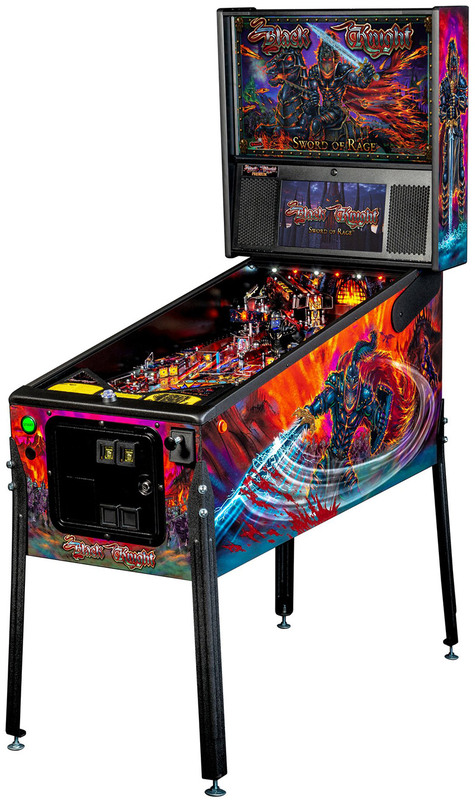 Under the glass, the Premium and LE models share the same playfield features which include an acrylic upper playfield with a full-size flipper and a three-ball lock, a stainless-steel shooter lane with the choice to launch to the upper or lower playfields, a drop target in the left orbit lane, and a powder-coated steel bottom apron. 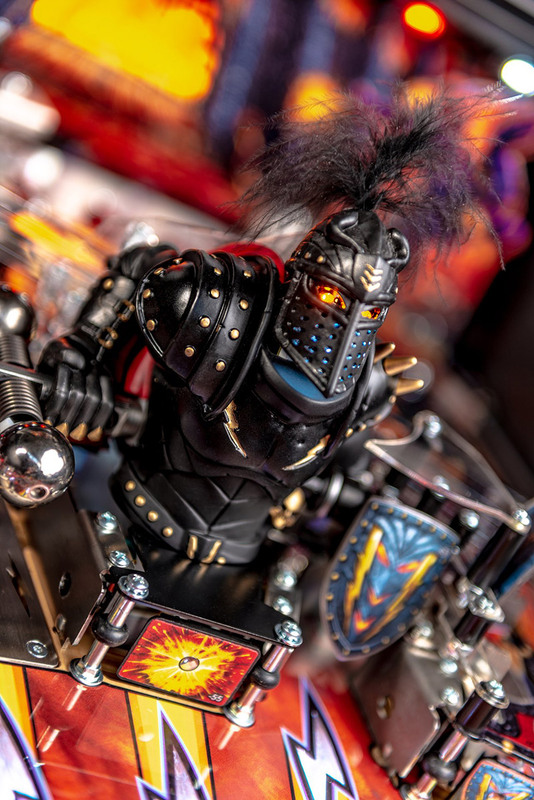 Probably the star of the game is The Black Knight himself. 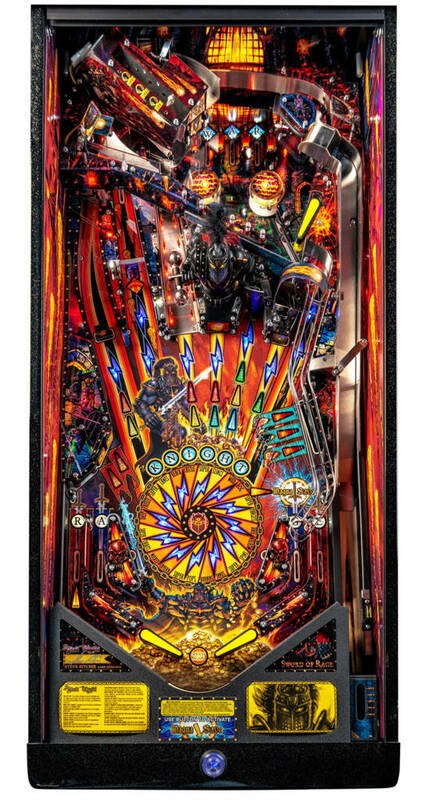 He is represented on the playfield for the first time as a model and, apart from being internally lit by RGB LEDs synced to his speech, he has a couple more tricks up his sleeves. 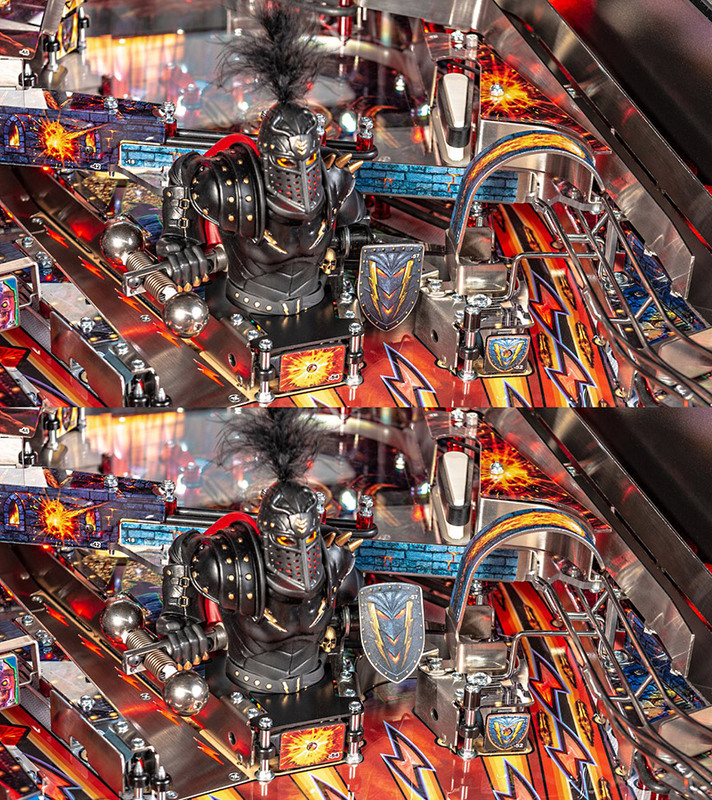 The Black Knight isn’t a bash toy exactly, as you shoot the standup target in front of him rather than hit the model directly. 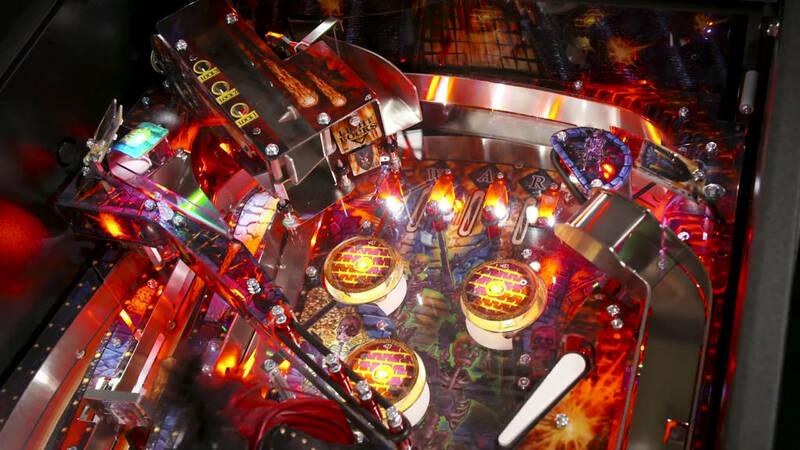 However, in his right hand is a a spinning flail which is motorised so it can spin whenever the ramp below is shot. 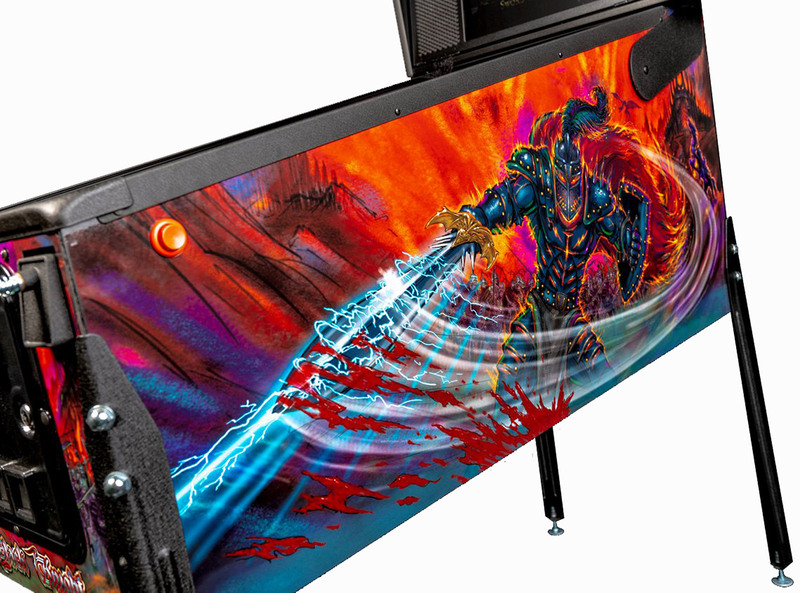 In his left hand is his shield which is hit directly and which raises when struck. 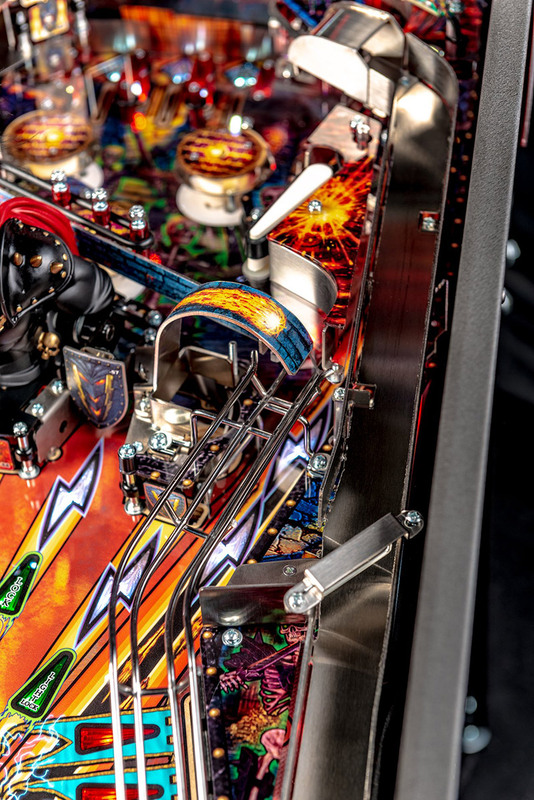 An opto switch in front of the shield senses hits and raises shield to allow access to a U-turn lane and upkicker behind. 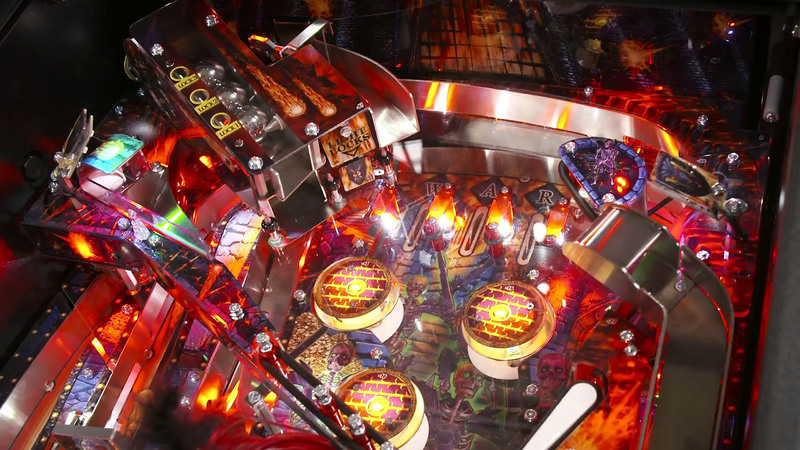 The shield lane upkicker, like another upkicker on the left, uses the ‘web-slinger’ curved ball guide to deliver the ball onto a passing wireform. 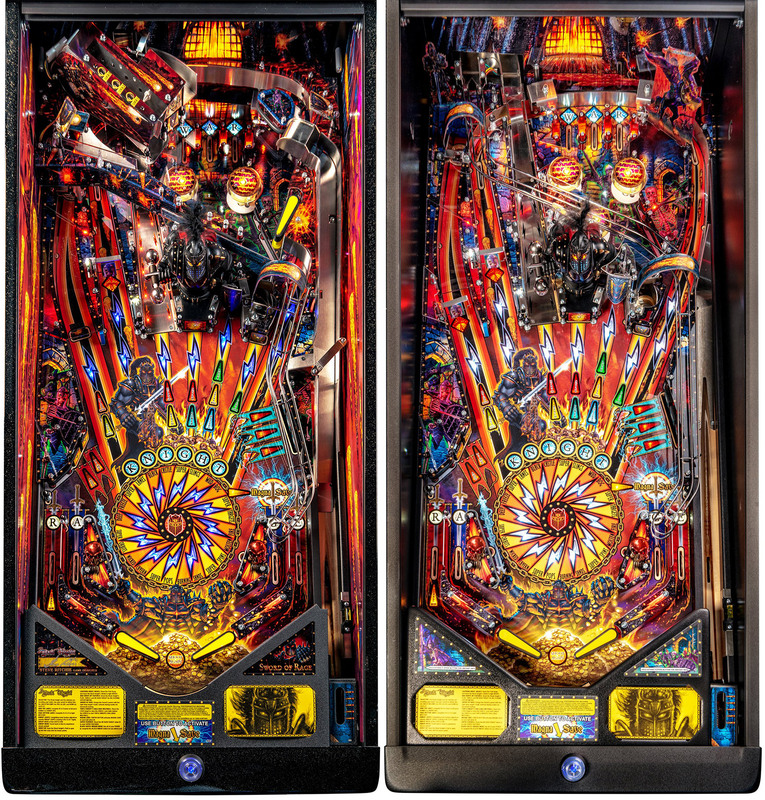 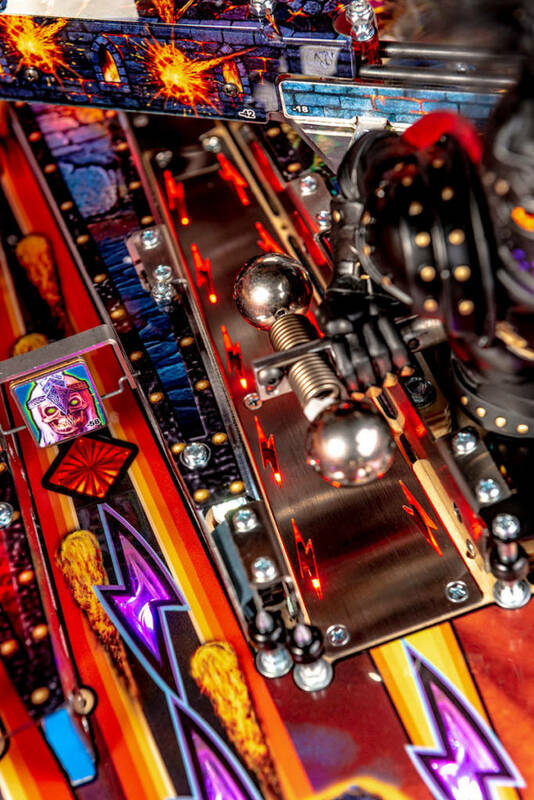 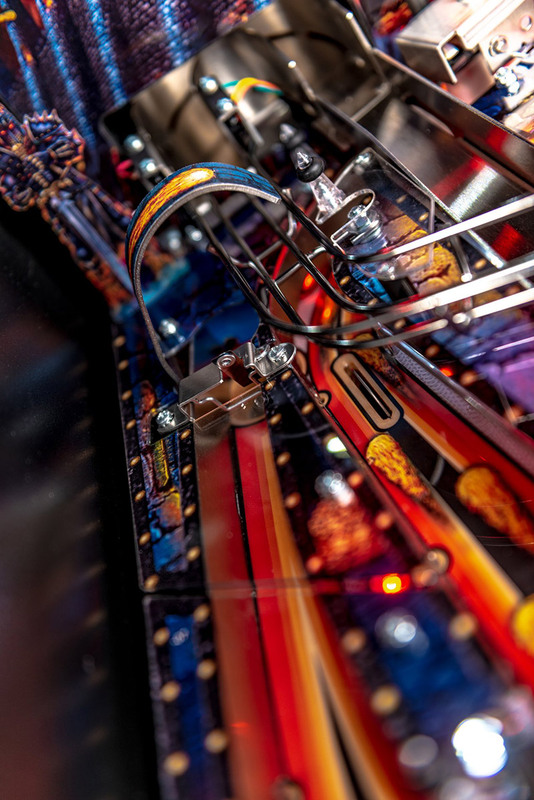 The upper-playfield on the Premium and LE models are made out of Lexan so you can see the pop bumpers and rollover lanes below (as long as it is kept clean). 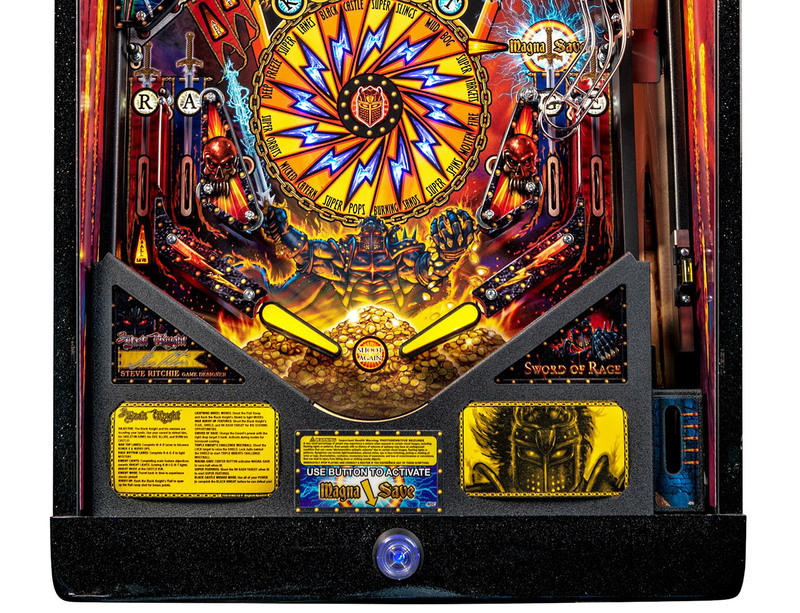 A standup target lights the locks on the metal ball lock mechanism which can hold up to three balls. These are shot into a vertical U-turn and then held in the lock by a retractable post. The released balls drop onto the Lexan playfield. 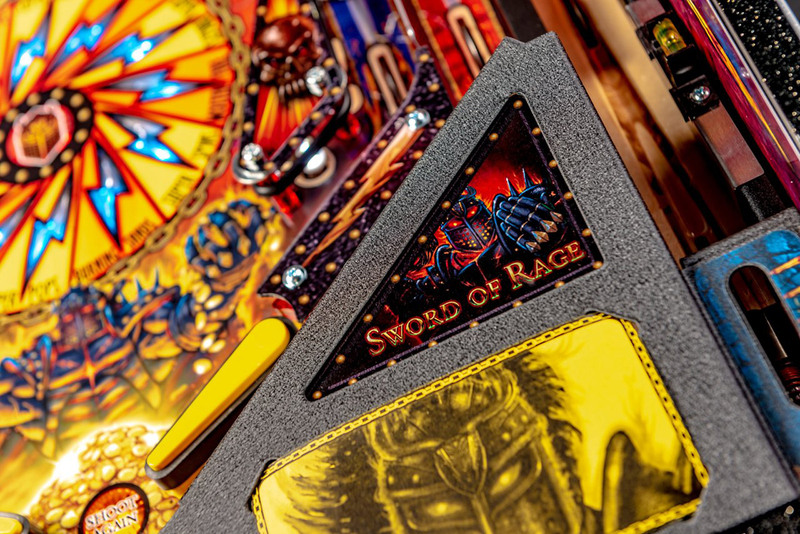 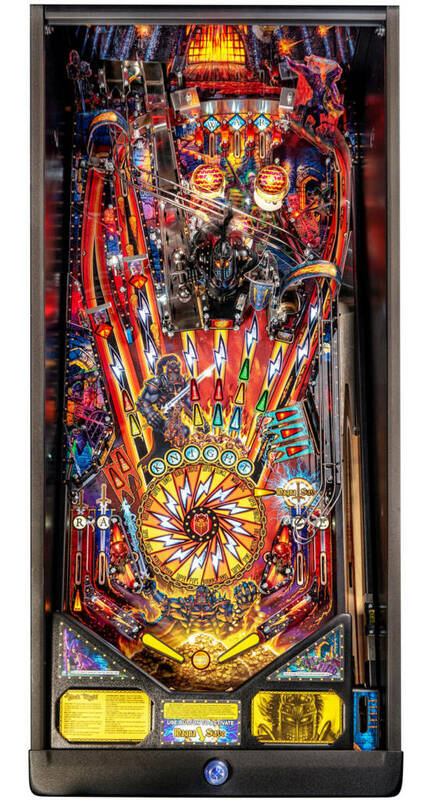 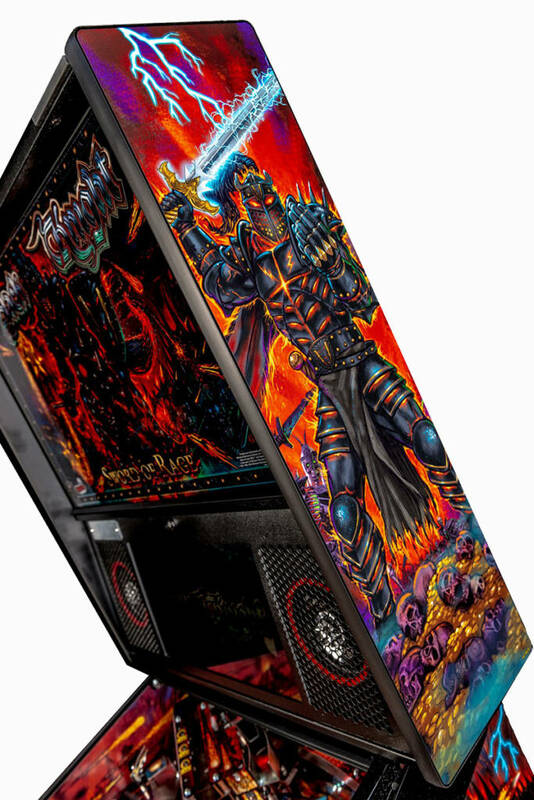 Being clear, there are limited opportunities for upper-playfield inserts to point to features, but no doubt the LCD display will direct you to the jackpot shots. 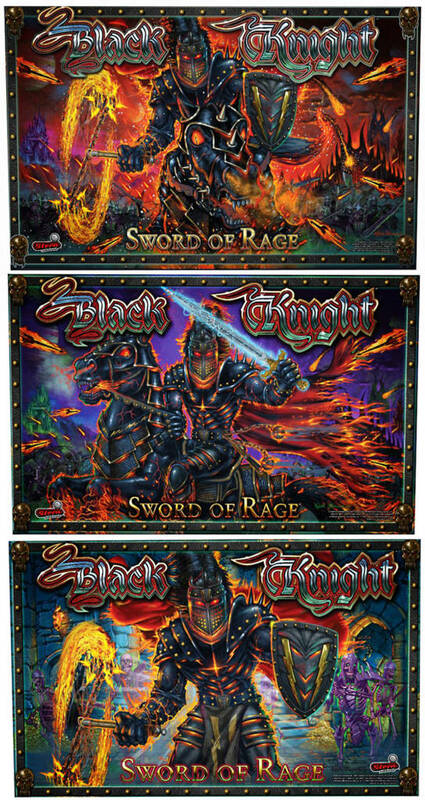 Two other big features from the earlier Black Knight games continue into this third game in the series. 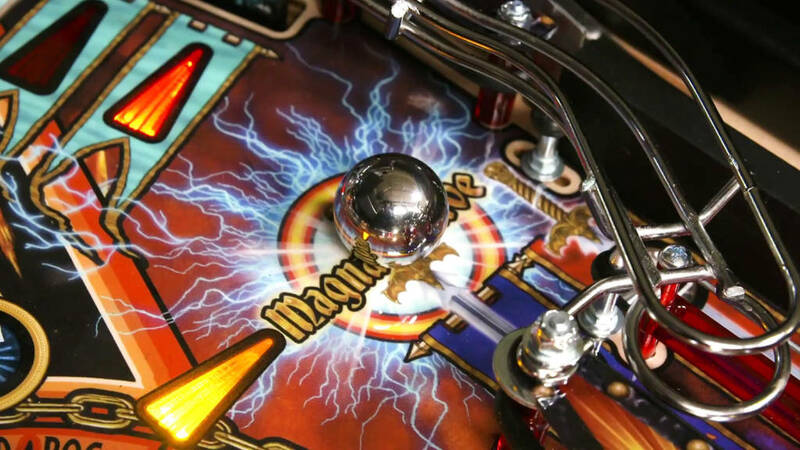 The second carry-over from earlier games is Magna-Save, the player-operated electromagnet found just about an outlane which allows a ball draining down the outlane to be stopped and dropped into the inlane instead. 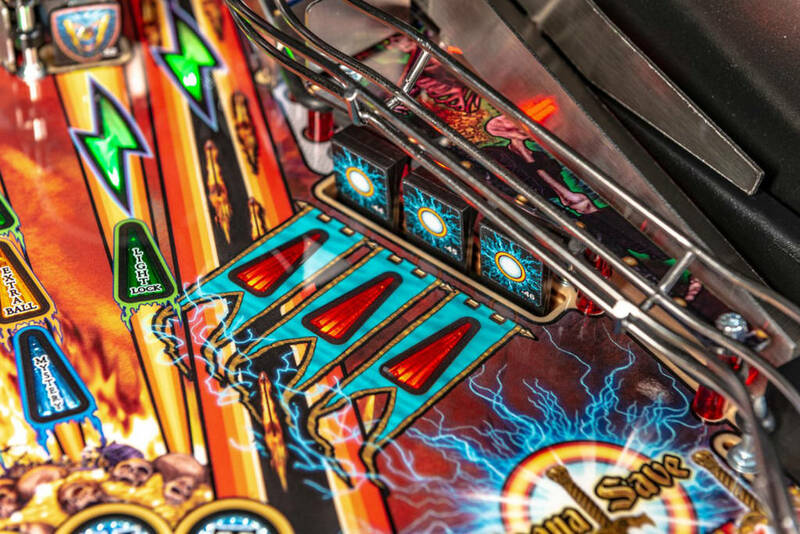 The feature is usually earned with playfield shots on a three-bank of drop targets and activated by a second flipper button. 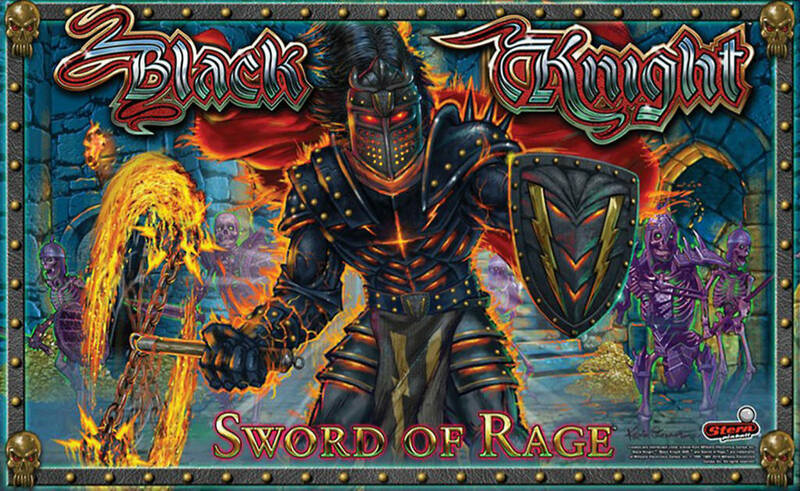 The three-bank is still there but on Black Knight: Sword of Rage the Magna-Save is activated by the action button on the lock bar. 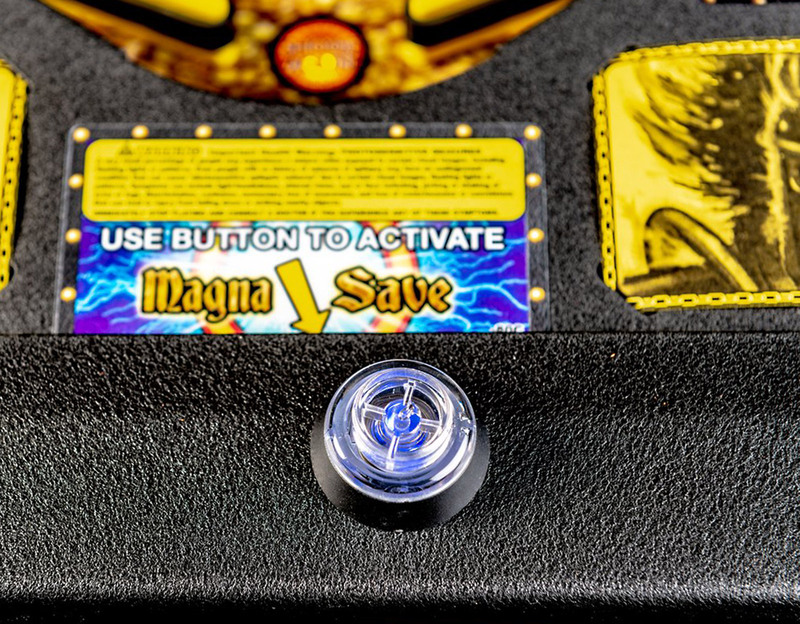 Unlike the original Black Knight but in keeping with the Black Knight 2000, Magna Save is only available on the right outlane. 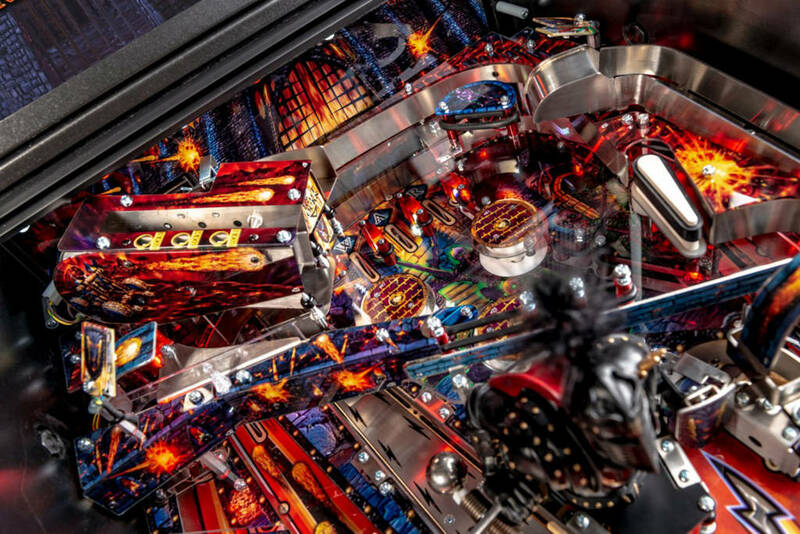 There is a ball save feature available on the left lane to get you back in the game. 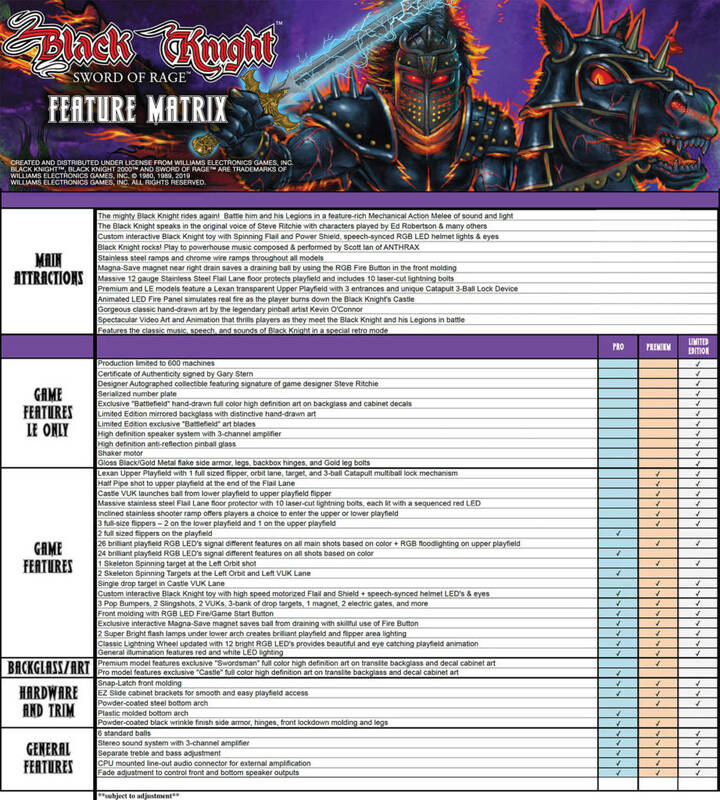 Here’s a full list of the features found in each of the three models. 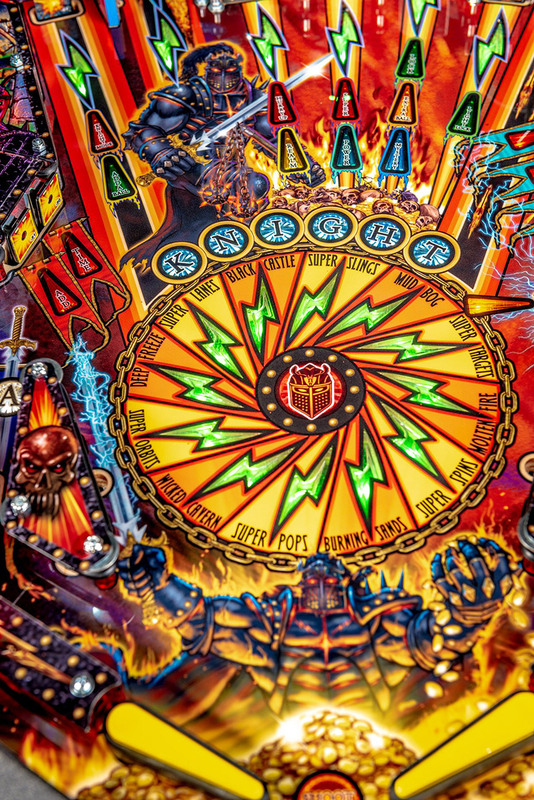 As with all the pictures here, you can click this for a bigger version if needed. 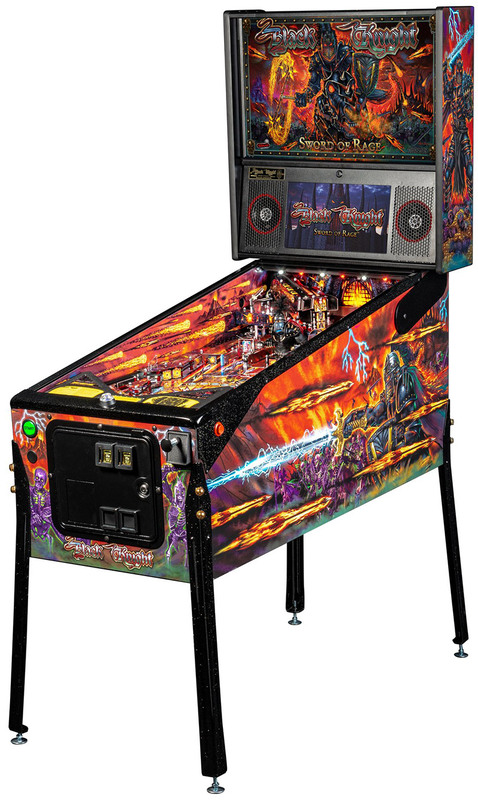 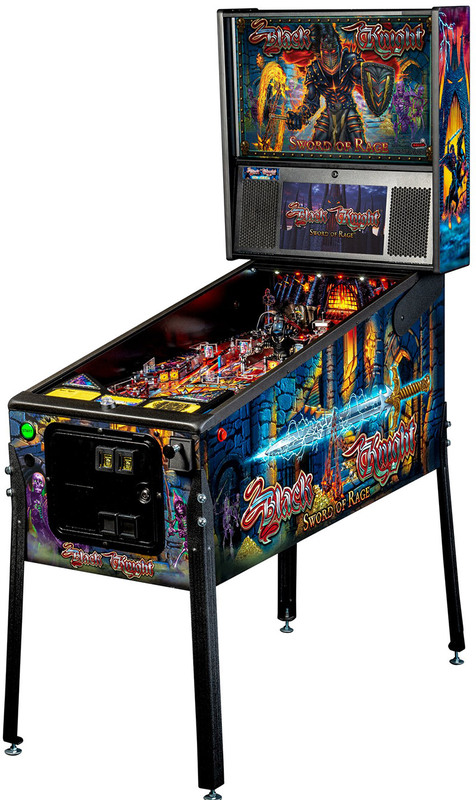 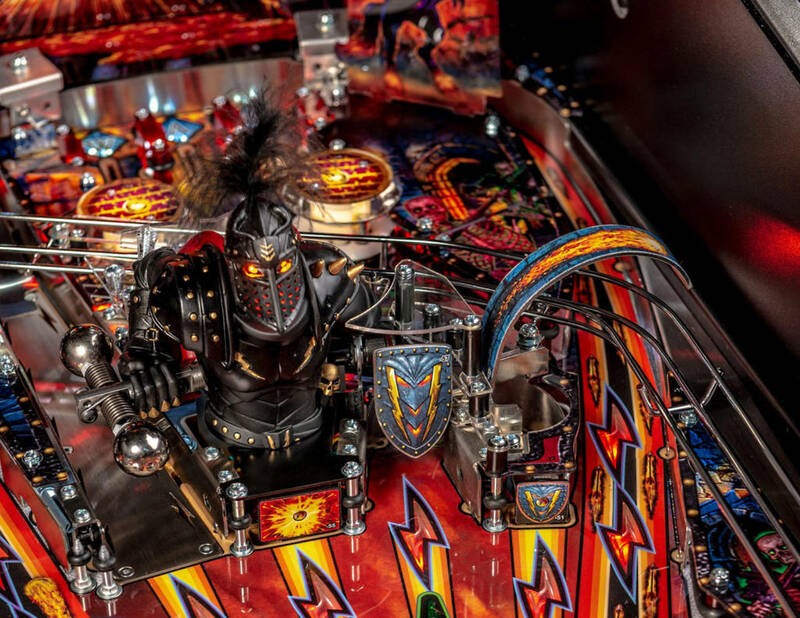 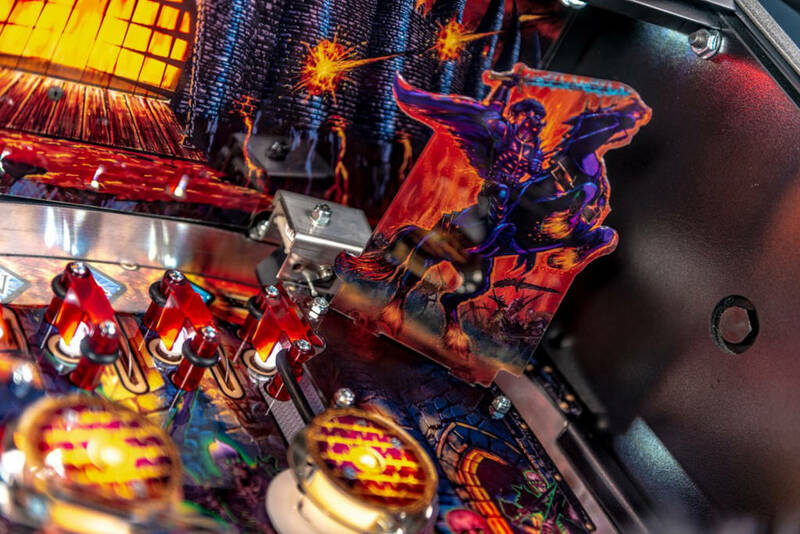 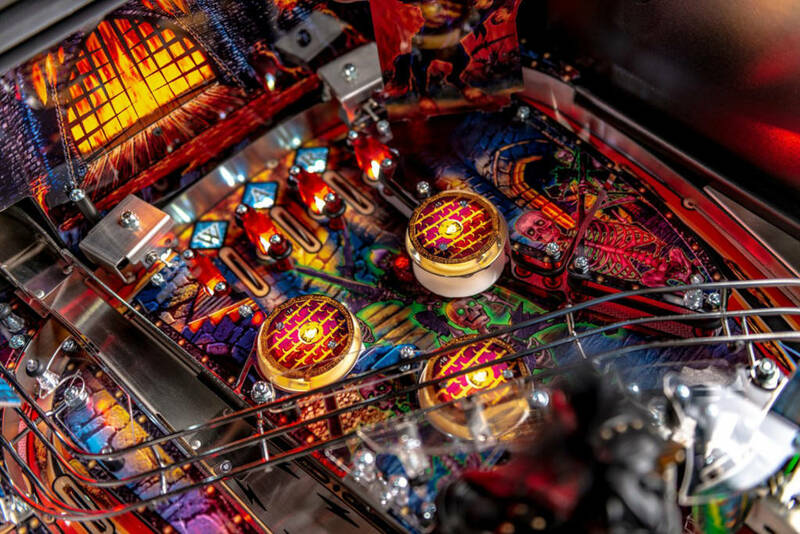 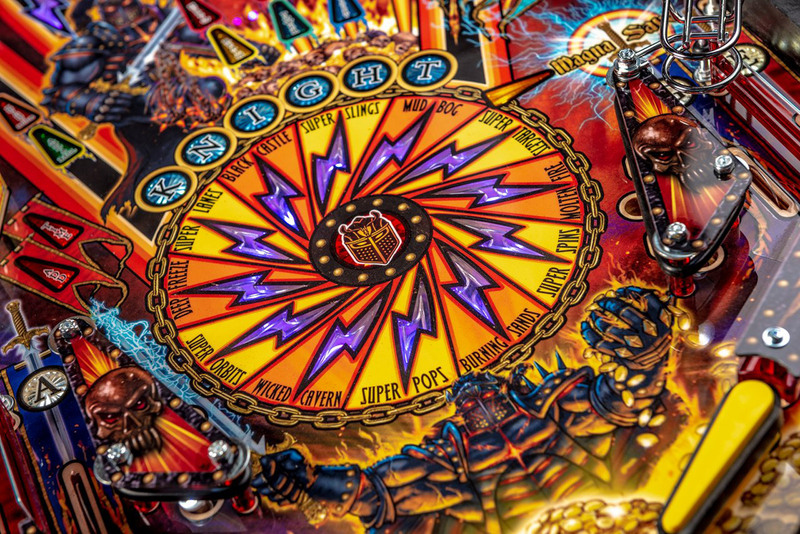 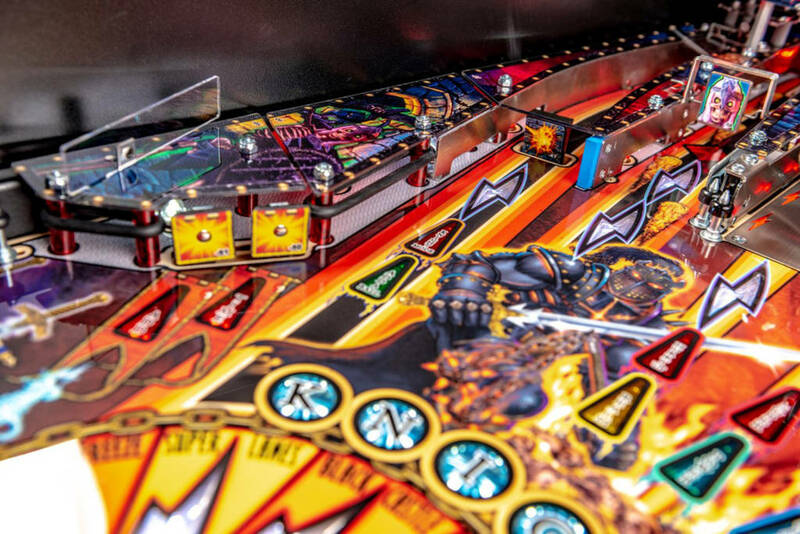 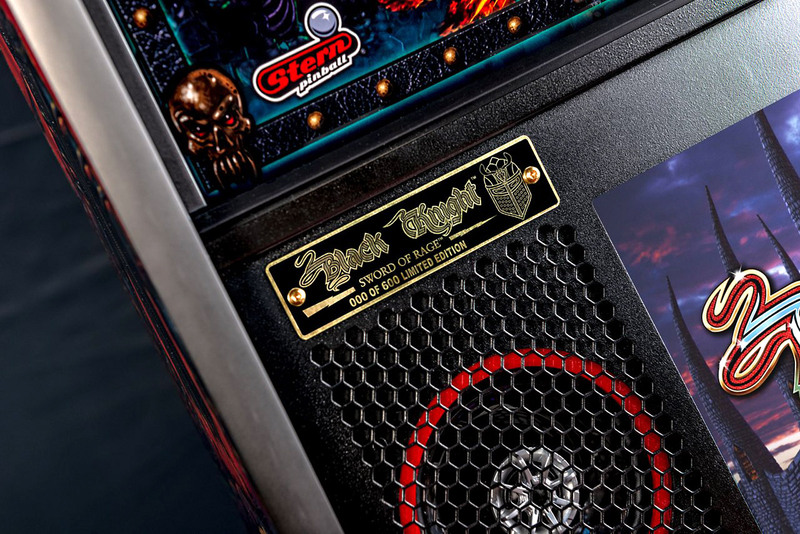 In addition to the detailed pictures, Stern Pinball also released a two promotional videos showing snippets of gameplay from the Premium and the Pro models, along with a sample of the music created by Scott Ian from the band Anthrax.